Another weekend has past. It was a really nice break. Friends were in fine spirits. Did you have a blast? Buying of tights in the city on Friday night. I have added bright blue, orange lacey ones, and ribbed mustard ones. So bright. So fabulous. Purchase of two new CDs for the collection – The Decemberists double live album. And Jack White’s solo album Blunderbuss fresh off the press. The Decemberists is the only one that has got much of a listen so far. It is fabulous to hear them unrestrained from the studio. They sound wonderful! I devoted some time to Jack’s album last night. So far I in a state of obsession about it. I did hark back to The Decemberists this morning on the bus, but I listened to Jack’s album almost twice in quick succession. His voice is jittery perfection, passion/agression and I just love the tinkly piano keys. Favourites so far include I’m Shakin’, Love Interruption and the title track Blunderbuss. Saturday night a few friends and I went to see Romantics Anonymous at Palace Barracks, my favourite cinema of all. 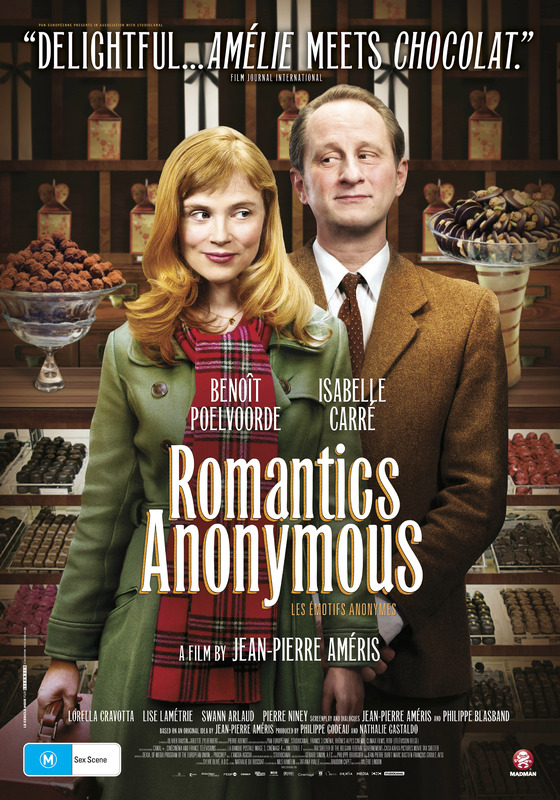 With a tagline of: ‘Amelie meets Chocolat’ I didn’t hold out too much of a hope for it. But it didn’t really bear any resemblance to either of those films other than it being a French film that involved a chocolatier. Not really a stretch for the imaginations of the promotional team. But it was a wonderful little film. Our group of four were in stitches. The kind of film where you don’t hold back your laughter. It sounded like we were the loudest people in the theatre. Not to say that the rest of the cinema weren’t enjoying it either. I think we all walked out of there brimming with smiles. The two leads were fabulous with all their neurotic behaviour. My winning streak with free movie tickets continues and last week I bagged a double pass to each of the following movies: King of Devil’s Island, Delicacy, and Trishna. It really is all about the movies of late. Have you seen anything wonderful lately? You might ask what the title of the blog post is all about? Did you happen to see any of the celebration of Rage’s Silver Jubilee Celebration on Saturday night/Sunday morning? It was hosted by You Am I’s Tim Rogers. It just felt like he was being needlessly dramatic with all the lengthy pauses and staring. I think the Rage team could have done much better with their choice of host.